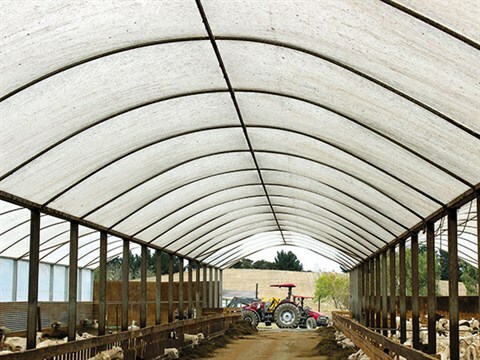 Whether it's horticultural crops, livestock herds, or even the odd ostrich you need sheltered from the elements, Taylor Built has the experience and technology to ensure you're – quite literally – covered. Back in 1984, Taylor Built's Greg Taylor identified a need among the lifestyle owners of 10-acre blocks for hardy, weather-resistant horticultural shelters and sheds. So how exactly did he stumble upon this apparent gap in the market? "Easy. I was one of those 10-acre block owners!" he laughs. That was 30 years ago and today Greg and managing director Lindsay Hamer's enterprise — incorporating Harford Greenhouses, Greenhouse Systems, and geotextile brand R.J. Reid – boasts a huge variety of clients here and overseas, in an array of different industries. In fact, the Taylor Built team estimates they've constructed over 100 hectares of greenhouses and shadehouses in the North Island alone. "We worked with Kevin Harford, who was based in Christchurch, and started with covering tomato and bean crops and developing new structures as the business grew. It wasn't long before we were covering animal herds as well. "We started with calf sheds and goat sheds, but we've got quite a menagerie on our books now. We've covered ostriches, alpacas, deer, even butterflies and monkeys," says Greg. While the differences between, say, a crop of tomatoes and a herd of alpacas may seem extreme at first glance, as I discover, there are common attributes to the shelter requirements for both animal and vegetable. "We essentially employ the same architecture regardless," says Lindsay, who worked as a structural engineer in the greenhouse industry before joining Taylor Built in 1994. 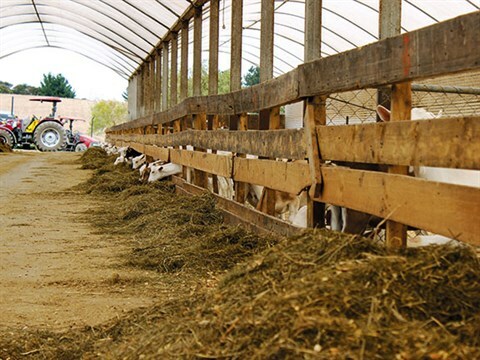 Providing for a warm, dry, and well-ventilated environment are key elements. It doesn't matter whether it's good crop health or good animal health — the technical means by which we achieve that end goal are very similar." The Taylor Built team adopts a consultative role with its clients to assess what type of shelter will suit best. Assessing temperature ranges and, where stock shelters are concerned, ideal square-metre space per animal are crucial. Service areas such as races and feed areas then have to be taken into account. As Greg tells me, there's no sweet spot as far as size goes — a shelter's footprint is generally dictated by ventilation requirements. But thanks to the modern modular design of the shelters, working with the client to configure the best solution is a relatively straightforward process. "The technology of the fabric itself has also improved over recent years," says Lindsay. "We're able to use additives to play with light spectrums. We can filter out the UV, or not, depending on what the client needs. We can have anti-fog film on the inside but not on the outside, so condensation runs to a low point and then drips off. We can use plastic or higher quality fabrics and utilise three-layer, five-layer, even seven-layer films in its manufacture. "You might think that'll add to the cost, but actually, while the material has become high tech over time, depending on the grade we're working with, it has also become cheaper as well. Of course, it's still the size of the market that dictates what can be done. A good middle-of-the-road form that can cover everything is always going to prove most popular." Lindsay says that although the film Taylor Built utilises for animal structures is 200 micron (which is pretty standard), it's actually stronger than some thicker materials. Additives enhance its robustness, meaning that in these modern times, thicker no longer necessarily means stronger. 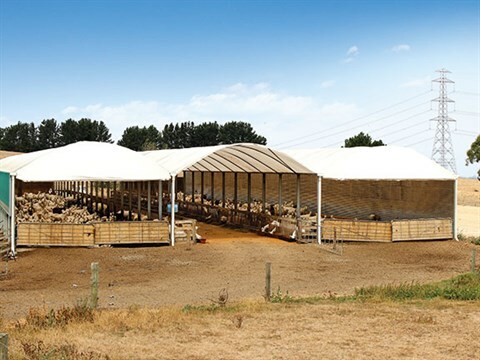 A strong shelter for a cost-effective price is exactly why Waikato goat farmer Campbell Storey looked to Taylor Built when, around 10 years ago, he adapted his property from having his herd outside in paddocks to the now more-prevalent shelter farming method. As Campbell explains, goats have no resistance to intestinal worms, but they're also the host of the worm. When a goat is carrying any sort of parasite stress, her milk levels will be very low. Relocating the herd inside takes the host off the pasture, breaking the worm cycle. The result for the Storeys? Milk production virtually doubled. "While we were researching shelters, we did our sums and realised a traditional-style barn with wooden poles and corrugated iron cladding would have costs three times as much as a Taylor Built shelter. "What's more, with the material letting much more light in, the bedding on the ground stays drier and fresher for longer. 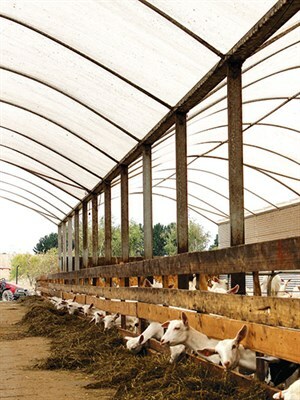 The entire environment for our goats is much airier, which promotes better stock health," says Campbell. A year after the first 21m x 62m shelter went up, Campbell bought the block next door and realised he'd need to expand his covered space accordingly. Now a central race system feeds off the two sheds which sit side by side. Fast forward to today and further expansion means a third Taylor Built structure will be going up in the next month or so. While it'll look pristine next to the existing structures, Campbell tells me the material on both of the original shelters is still original and has worn extremely well. "We're very happy with the shelters," he says. "Aside from cost, the other benefits include great airflow and very little humidity. "They're built on a slight angle, which we've deliberately exploited to increase the convectional airflow. As the temperature rises during the day, the heat moves outside. This means we can maintain a steady temperature inside." right for assembly work, especially where ensuring the fabric cover has been tensioned correctly. Not only does Taylor Built utilise a network of local builders covering the entire country, the same team of contractors will also undertake maintenance work where it's needed. "We optimise every part of the manufacture process," says Greg. "Fabric, steel... we work to ensure there are no overs and no wastage during production, which is another reason why the modular system works so well for both us and our customers. "It also mitigates complexities in the build process. Working heights during assembly are something we need to plan carefully, but complying with health and safety is a big part of what we and our contractors do. We weren't using scissor lifts 20 years ago, but they speed everything up now." With garden centres, hardware stores, and even butterfly houses counting among their clients these days, Greg and Lindsay may have moved far beyond the realms of that 10-acre block that started it all. But rest assured, there'll still be Taylor Built shelters dotting the landscape on many of those smallholdings even today.